The changing forests of Michigan's Upper Peninsula are once again home to one of North America's most interesting predators. The fisher, a quick and agile tree climber, was reported extirpated from our state as a result of extensive logging in the 1800's, subsequent fires, and intensive trapping through the 1920's. But a reintroduction effort in the Ottawa National Forest in the 1960's was a huge success, and fishers are now sufficiently abundant throughout the Upper Peninsula to allow limited trapping. More than 600 fishers were legally trapped in 1998, evidence of a thriving population. 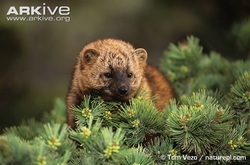 The fisher and its smaller relative, the pine marten, are the only medium sized predators which pursue prey in trees and also seek prey in holes in the ground, hallow trees, and other cavities. Fishers grow to about 25 inches in length and adults weigh 5 to 12 pounds. Fur color varies among individuals but most fishers are dark brown with some silver-colored hairs on their head and shoulders. Fur on the legs and tail is usually darker than other parts of the body. One of the fisher's interesting adaptations is retractable claws, like those of a cat. Fishers usually eat mice, porcupines, squirrels, snowshoe hares, birds, and most any other small animal that inhabits continuous forests with mature trees. They will hunt in any kind of woods, roaming from conifer to hardwood stands, as long as there is continuous overhead cover. The ability of fishers to kill porcupines without being seriously injured is legendary, and there have been some reports of fishers feeding on deer carcasses. Like other predators, fishers may occasionally supplement their diets with fruits, berries, and acorns. Fishers are most abundant where there is plenty of ground cover like logs, stumps, fallen trees, and brush piles. They use ground burrows in the winter and tree nests all year, especially in spring and fall. During the winter, many fishers occupy snow dens, which are burrows under the snow with long, narrow tunnels leading to them. The breeding season is late winter and early spring. The gestation period is a surprisingly long, 11 to 12 months. Females have their first litter at age two, and bear one to five young every year after that. That means the females spend almost their whole lives either pregnant or suckling young. Most dens in which young fishers are raised are high up in hollow trees, with females frequently moving their young if disturbed. ​Mating season is the only time adult fishers travel together. Males usually try to drive each other away. Home ranges are about 8 to 20 miles across. They mark boundaries with scent, but seem to tolerate some overlap in home ranges. Fishers are active in both day and night, but are rarely seen by humans. They have lived for more than 10 years in zoos, but are hard to breed in captivity. Most biologists agree that fishers are a welcome addition to Michigan's landscape. They help control porcupines which can damage timber if overabundant, and are unlikely to adversely impact populations of any wildlife species of special concern. They will continue to be a part of our wildlife heritage as long as modern logging practices conserve some large blocks of mature trees. All available evidence suggests that the fisher population can withstand the trapping pressure currently allowed under state regulations.